TP Trailers offers storage containers for rent in multiple sizes, that can be customized with a variety of interior options. Also called shipping containers, sea containers and Conex boxes, these steel containers are crucial to multiple industries like construction and retail. When used by construction companies, portable storage containers protect tools and jobsite materials from the elements on a long build. In retail, Conex box rental is a popular solution to safely store shipments of merchandise that can’t yet be shelved. When selecting your shipping container, choosing the right size to meet your needs is one of the most important aspects. Whether in retail or construction, you need to ensure you have ample storage space without exceeding the area allotted for the sea container. 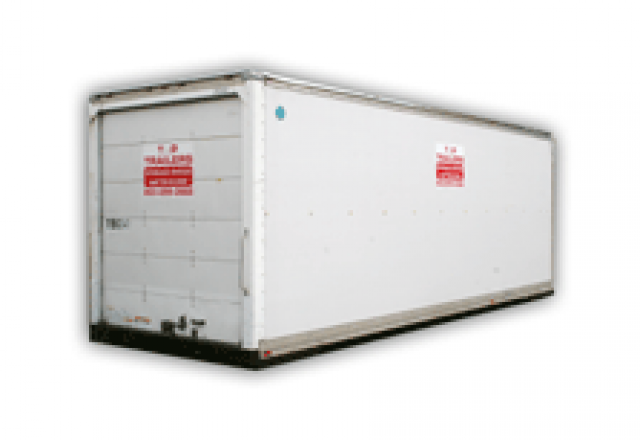 TP Trailers offers portable units for rent in the following sizes: 8’ x 20’, 8’ x 24’ and 8’ x 40’. Call our rental agent for pricing and availability today! Our 8’X20’ storage containers, sometimes called conex containers or sea containers, are perfect for all of your storage needs. These units are wind and water tight with easy to open doors and latches. These containers are secure, lockable, and great for temporary storage. Types of uses include construction material, retail storage, residential, commercial storage, document storage and equipment storage. We offer shelf racks and pipe racks for rent to keep your storage container organized. These storage containers are also available for sale. These units are delivered on a roll back, they require 60’ of straight space for loading and unloading. These units also require 13’ 6” of clearance to deliver. Our 8’X40’ storage containers, sometimes called conex containers or sea containers, are perfect for all of your storage needs. These units are wind and water tight with easy to open doors and latches. These containers are secure, lockable, and great for temporary storage. Types of uses include construction material, retail storage, residential, commercial storage, document storage and equipment storage. We offer shelf racks and pipe racks for rent to keep your storage container organized. These storage containers are also available for sale. These units are delivered on a tractor trailer, they require 100’ of straight space for loading and unloading. These units also require 13’ 6” of clearance to deliver. Our 8’ X 24’ storage boxes are perfect for storing pipe and other material that is larger than 20’ in length. These units are typically rented for pipe storage at job sites. These units come with a roll door on one end. Pipe racks and shelf racks are available to help organize space. We believe that if you’re renting a storage container to protect something, it’s important to you and your business. That’s the reason TP Trailers offers Conex boxes that are guaranteed to be wind and water tight. In addition, our ground level storage containers make the loading and unloading of your material convenient. TP Trailers also includes delivery and set-up with almost all of our Conex box rentals. Contact us to get your storage container rental quote today!